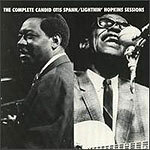 CD review: "The Complete Candid Otis Spann/Lightnin' Hopkins Sessions"
For those not familiar with Mosaic Records, the mail-order and online-only company specializes in reissuing collections of major jazz artists. The LPs and CDs  all in limited editions  are handsomely packaged in boxed sets with lavishly produced sound quality and beautifully written and designed pamphlets with historical and biographical background information. Mosaic's latest release is a departure, as it features two blues artists  Otis Spann and Lightnin' Hopkins. Before you get too excited, no, they don't play together here. Instead, this is the complete recordings the two blues giants made for Nat Hentoff's short-lived Candid jazz label in 1960. The Spann material isn't necessarily what you would expect from Muddy Waters' piano player. Spann plays as much stride as boogie woogie, and deftly combines the two styles into a seamless whole with a dash of ragtime thrown in. For instance, his reading of "Cow Cow Blues" owes as much to the stride style of James P. Johnson and Kansas City swing of Bill Basie as it does to any Mississippi or Chicago bluesman, while "Otis in the Dark" has a certain Joplinesque feel to it. Spann plays with so much authority, and such a big, full sound, that one never gets the feeling during solo passages that anything is missing. Spann's technical proficiency and artistic vision create a multi-textured sound that is enthralling both for the sheer skill needed to pull it off and the lushness of listening to so much music come from a single instrument. This recording really reminds one more of Bud Powell or Art Tatum than of just about any blues pianist one could think of. Much of the credit should probably go to producer Hentoff. One of the few jazz writers/producers of prominence who's as comfortable with and knowledgeable of blues as with jazz, perhaps only Hentoff could have shown enough respect and confidence in Spann to give him free stylistic rein. The resulting jazz-oriented recording is testimony both to Spann's underappreciated talent and Hentoff's open-mindedness. If there's a fault to be found here, it's in the presence of guitarist Robert Jr. Lockwood. A fine guitarist who has made some stellar recordings on his own, on these sessions Lockwood is out of tune for several cuts, out of rhythm for most of the rest, and generally out of sync. He never hits Spann's groove; thus, the most rewarding tracks here are those where Spann is recorded solo. The Lightnin' Hopkins set is likewise stellar. Even those who don't particularly like traditional country blues, who have no interest in listening to a Robert Johnson or a Blind Lemon Jefferson, are still likely to enjoy Hopkins. His music is so melodic, his guitar playing and vocals so smooth, that these recordings, over a quarter-century old, sound as contemporary as anything now being recorded. As with Spann, Hopkins is best in a solo setting  anything else seems superfluous. His nasal vocals convey perfectly his autobiographical and anecdotal lyrics, while his acoustic guitar playing is best accompaniment one could imagine. A special treat on the Hopkins sides is "Lightnin's Piano Boogie." While he's no Otis Spann, Hopkins still shows some pretty impressive chops on the keyboard, with the same herky-jerky, start-and-stop playing he was so famed for on guitar. While this isn't a perfect collection  see the notes on Lockwood above  it's darn near close. In any case, Mosaic's catalog alone is worth getting if only to hate them for all the great music you now know about and can't afford to buy. Mosaic Records' address is 35 Melrose Place, Stamford, CT 06902.